We cloned and characterized the ZmWRKY17 gene from maize. Overexpression of ZmWRKY17 in Arabidopsis led to increased sensitivity to salt stress and decreased ABA sensitivity through regulating the expression of some ABA- and stress-responsive genes. The WRKY transcription factors have been reported to function as positive or negative regulators in many different biological processes including plant development, defense regulation and stress response. This study isolated a maize WRKY gene, ZmWRKY17, and characterized its role in tolerance to salt stress by generating transgenic Arabidopsis plants. Expression of the ZmWRKY17 was up-regulated by drought, salt and abscisic acid (ABA) treatments. ZmWRKY17 was localized in the nucleus with no transcriptional activation in yeast. Yeast one-hybrid assay showed that ZmWRKY17 can specifically bind to W-box, and it can activate W-box-dependent transcription in planta. Heterologous overexpression of ZmWRKY17 in Arabidopsis remarkably reduced plant tolerance to salt stress, as determined through physiological analyses of the cotyledons greening rate, root growth, relative electrical leakage and malondialdehyde content. Additionally, ZmWRKY17 transgenic plants showed decreased sensitivity to ABA during seed germination and early seedling growth. Transgenic plants accumulated higher content of ABA than wild-type (WT) plants under NaCl condition. Transcriptome and quantitative real-time PCR analyses revealed that some stress-related genes in transgenic seedlings showed lower expression level than that in the WT when treated with NaCl. Taken together, these results suggest that ZmWRKY17 may act as a negative regulator involved in the salt stress responses through ABA signalling. The online version of this article (doi: 10.1007/s00425-017-2766-9) contains supplementary material, which is available to authorized users. 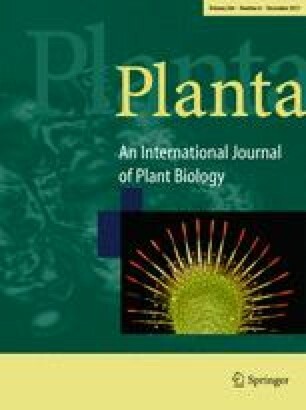 We thank Chuanxiao Xie from Institute of Crop Science, Chinese Academy of Agricultural Sciences, Beijing, China, for offering us the maize and Arabidopsis seeds in this study. This work was supported by the National Key Research and Development Program (2017YFD0101205) and the Key Technologies Research and Development Program of Anhui Province (15czz03119).